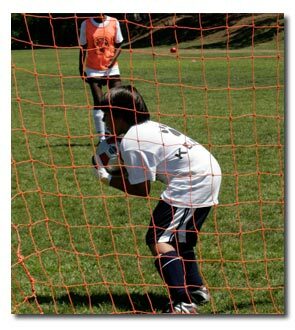 Goalkeeper Soccer Camps Two is designed for children ages 10 to 13 and emphasize technical and tactical training as well as coordination and conditioning for Goalkeepers. To ensure proper training our coach to player ratio is 1: 6 or less. Goalkeeper training runs Monday through Friday from 8:30am to 9:30am. Immediately following the Goalkeeper training session you have a half day (9:30am-12:30pm) or a full day (9:30am-3:00pm) camp option to apply your learned skills in game situations. Coaches will monitor progress and provide all players with an evaluation report at the end of camp. Goalkeeper Camps are available at all our sites. A separate registration must be filled out and paid for by each participant.